I know you have heard of the term Bungalow many times that refers to a house. I am sure you have also heard many people referring to a particular home as a bungalow. According to Wikipedia, a bungalow is a type of building that commonly includes verandas and are low rise. These could either be single-story or has a second story built into a sloping roof and would usually have dormer windows. Most of the time, bungalows are relatively small but these days there are already large bungalow homes. That is why the term bungalow could vary in definition. Some may not even use it anymore especially for modern houses. But this house that we will feature today is called a bungalow by the designers. 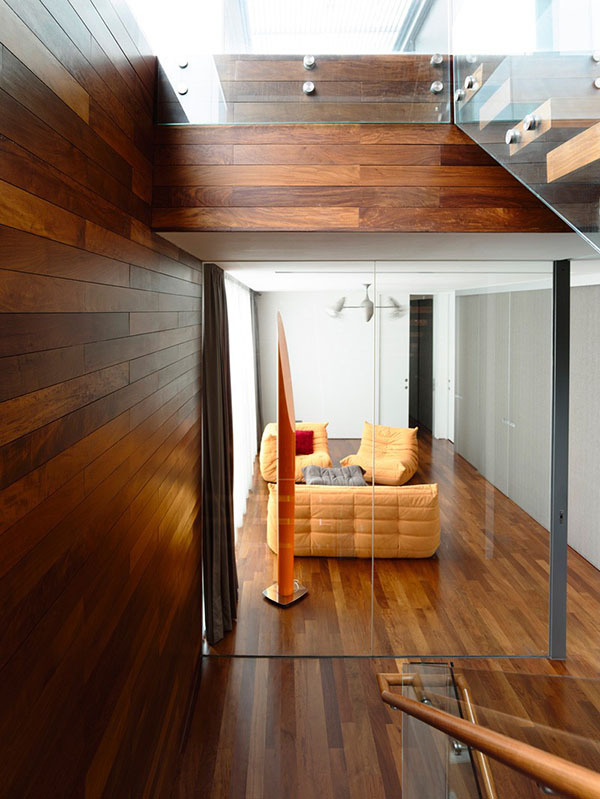 It is a two-storey home that was formerly a semi-detached house. 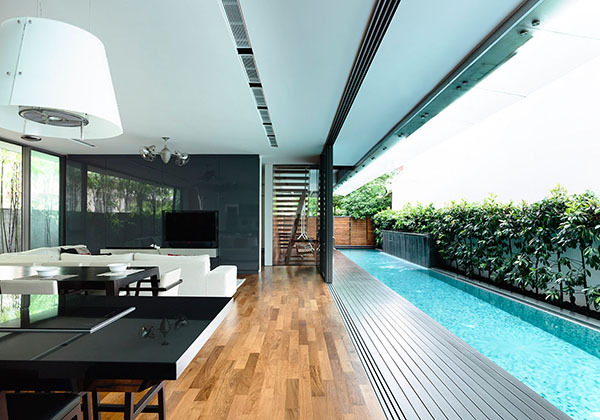 It features a lap pool between the new house and the party wall that creates a private courtyard space. It also has an attic as well as beautifully designed interiors. You can sense some variation in the bedrooms but each space has something that makes it look coherent to the rest of the house. The house stands full of drama and transparency when the lights are on. Good thing, there are trees in front that also serves as a privacy screen. 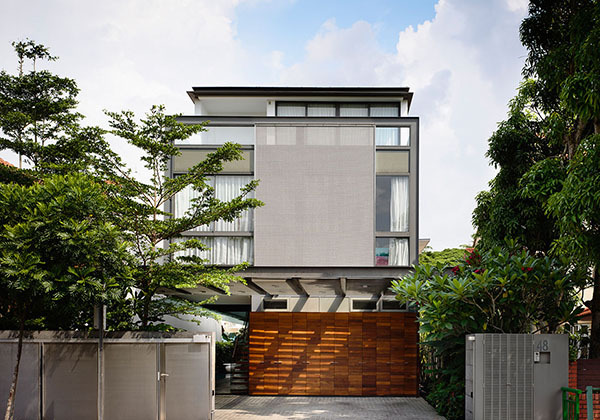 The facade of the house reveals a mix of materials that made it look very interesting. 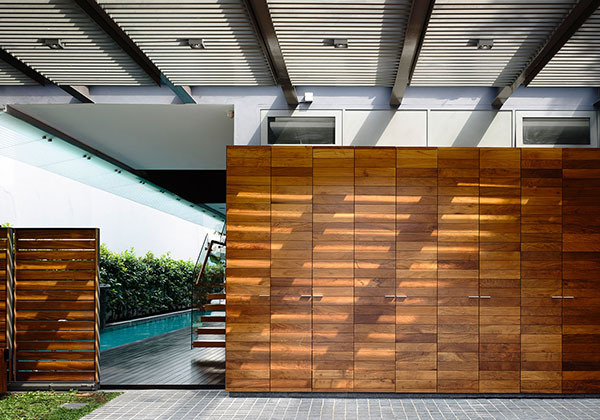 This beautiful wooden wall gives privacy to the pool area so it won’t be seen from the streets. 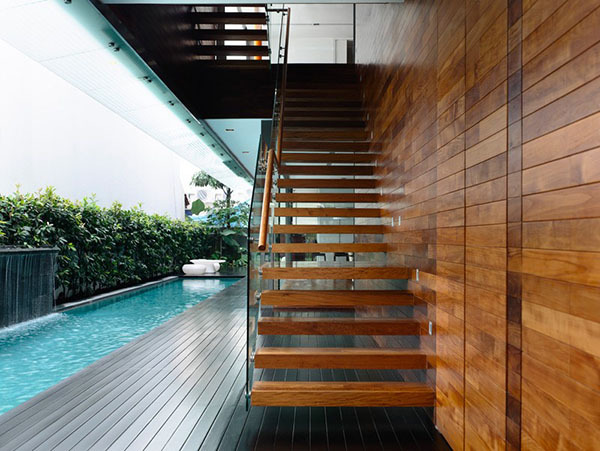 The staircase looks like floating because the railing ended on the last tread instead of on the flooring. Great idea, isn’t it? Look at that ceiling light! 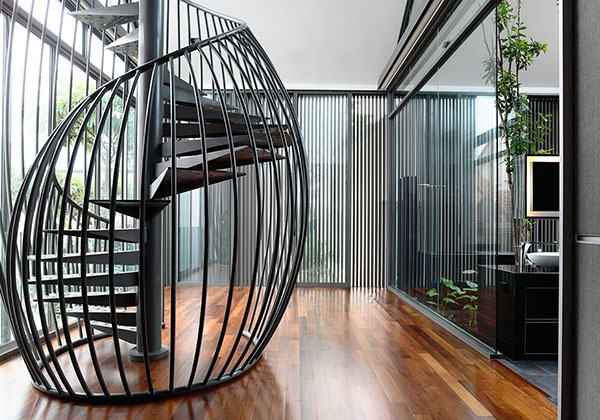 It has a sculptural design that added beauty to the entire interior. 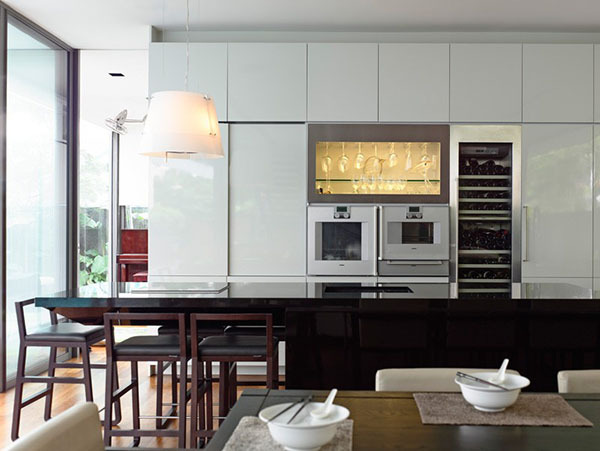 The kitchen looks neat in contrasting black and white with high-tech equipment and appliances. You can directly see the pool area from the living space that is merely separated by a sliding glass door. 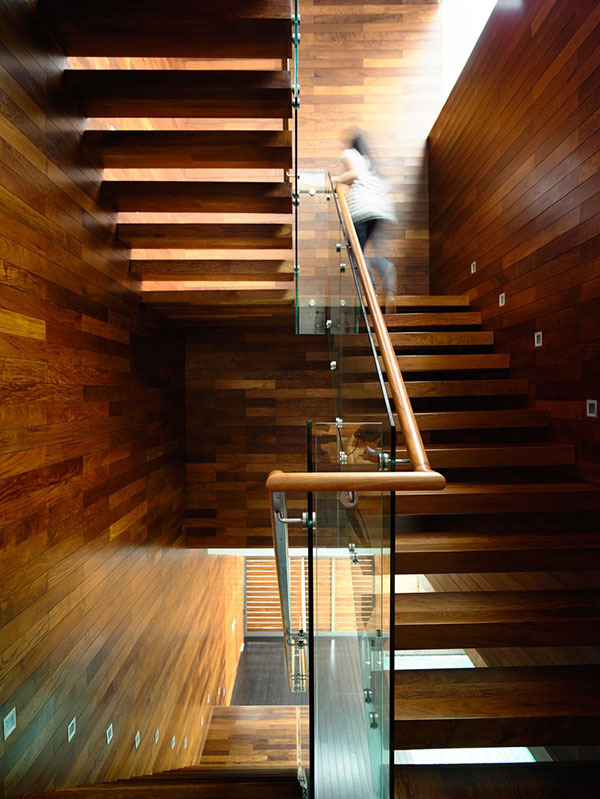 You can see wood here for the walls, treads and even to the hand-rails. But note the mix of stainless and glass too. 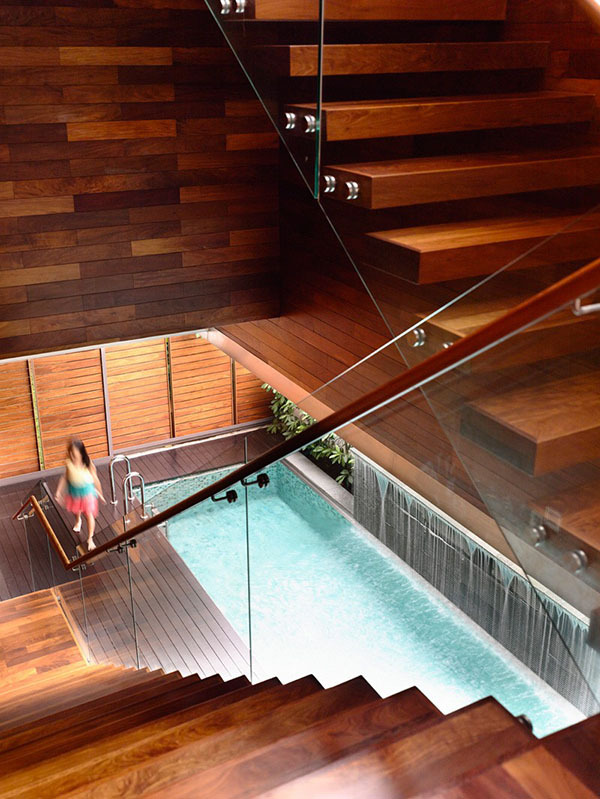 This wooden staircase with glass railings connects the different areas of the house and can even be used to access the pool. That area with floor level sofas is like another living space or maybe an entertainment area. Seen here is the masters bedroom with wooden walls. It is very spacious as it has its own large master bathroom as well as a staircase. 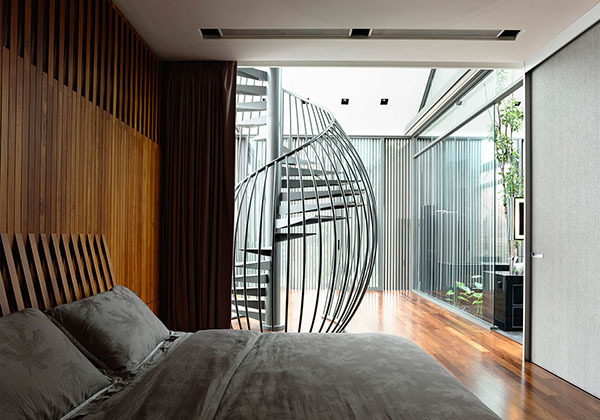 From the masters bedroom, one can reach the attic through this artistic spiral staircase. I can tell that this one is for the boys. It has a curvy wall with a modern design. What a pretty bedroom for a girl! it has a built-in shelf for stuffed toys but what caught my attention is the wall covered in upholstery of different panels and colors. 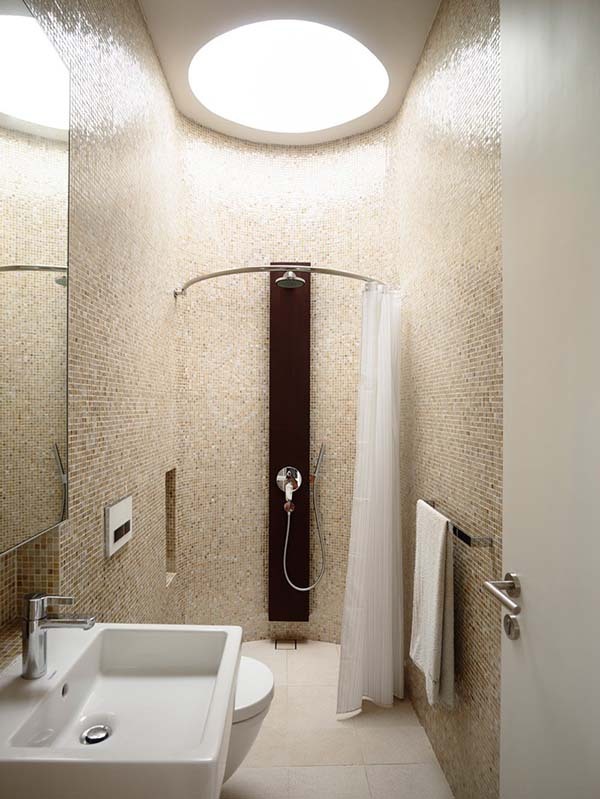 This is the master bathroom with a rainforest tree in the middle. This is the bathroom for the children. It can be easily accessed from their bedrooms. You can see here a very calm interior for the study and home library. It features Ligne Roset sofas. 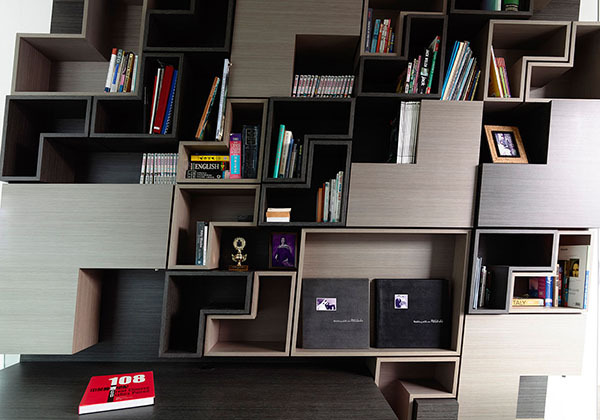 The shelves in this area are inspired by the shape of the Ligne Roset sofas. Beautiful! This is indeed a stunning home! But after seeing the images, I am no longer sure if this is actually a bungalow. Lol. It is quite different from the ones I usually see. 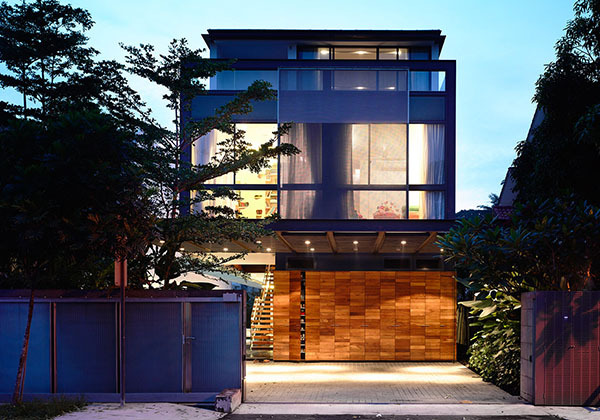 But anyway, bungalow or not, this is still one awesome house design from Hyla Architects and I am certain that you would agree with me. 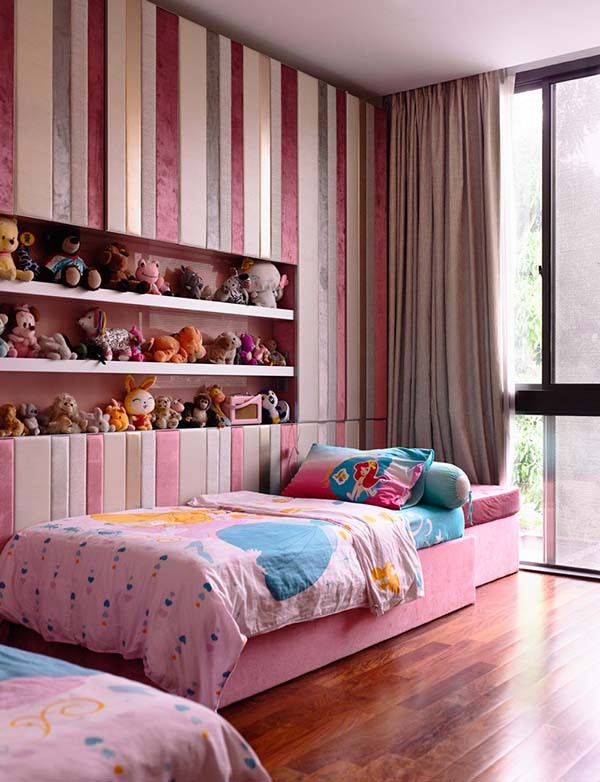 I find the children’s bedroom lovely as well as the pool area too. 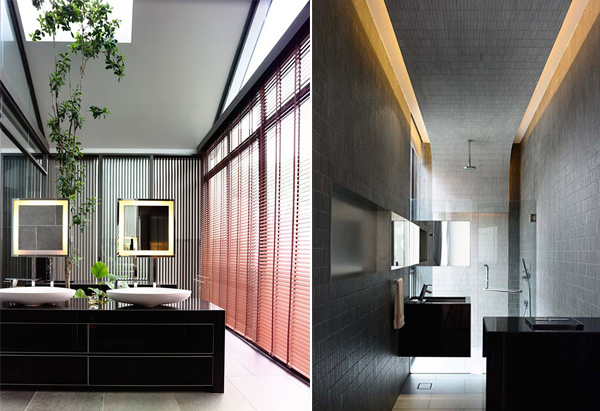 How about you , which areas of the house do you love most?